At the U.N. General Assembly, Netanyahu said Iranian officials were keeping tons of nuclear equipment and material in a warehouse in Tehran. UNITED NATIONS — Israeli Prime Minister Benjamin Netanyahu accused Iran on Thursday of keeping a "secret atomic warehouse" just outside its capital, despite the 2015 deal with world powers that was meant to keep it from obtaining nuclear weapons. Netanyahu's disclosure — which he presented as a big reveal on the international community's biggest stage — came four months after Israel announced the existence of what it said was a "half-ton" of Iranian nuclear documents obtained by Israeli intelligence in the Shourabad neighborhood near Tehran. Israel said the cache proved that Iranian leaders covered up their nuclear weapons program before signing the nuclear agreement. Iran hasn't acknowledged the alleged seizure. "You have to ask yourself a question: Why did Iran keep a secret atomic archive and a secret atomic warehouse?" he asked. "What Iran hides, Israel will find." There was no immediate official response from Tehran. Iran's mission to the U.N. did not respond to a request for comment. 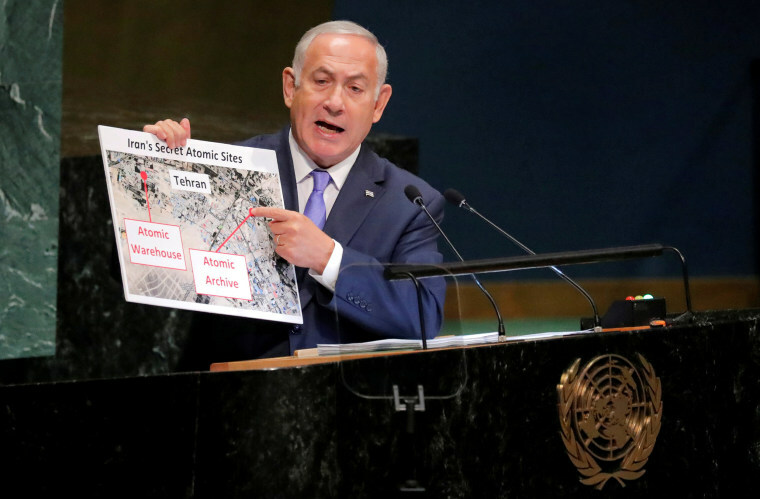 Iran's state-run, English-language Press TV channel carried Netanyahu's remarks live, but cut away after he made the allegation about the nuclear warehouse. Netanyahu noted that Israel had long opposed the multinational agreement with Iran. Israel considers Iran its biggest threat, citing Tehran's calls for Israel's destruction, its support for hostile militant organizations like the Lebanese Shiite Hezbollah group and Iran's development of long-range missiles. U.S. President Donald Trump pulled his country out of the nuclear deal in May, and his administration has been re-imposing sanctions on Iran. Israel applauded Trump's decision, but many other nations lamented it as jeopardizing what they saw as the best chance for keeping Iran from becoming a nuclear-armed power. "Instead of coddling Iran's dictators," other countries should support the sanctions, Netanyahu said to applause. Netanyahu's revelation came shortly after Palestinian President Mahmoud Abbas took Israel and the U.S. to task in his own speech, declaring that his people's rights "are not up for bargaining" and that the U.S. was undermining the long-discussed two-state solution. But Netanyahu devoted less attention to his country's long-running conflict with the Palestinians. Abbas halted ties with Trump's administration in December after the U.S. recognized contested Jerusalem as Israel's capital, and Palestinians have said a pending U.S. peace plan will be dead on arrival because of that and other recent U.S. moves that Palestinians see as favoring Israel. "Jerusalem is not for sale," Abbas said to applause as he began his speech. "The Palestinian people's rights are not up for bargaining." He said Palestinians would never reject negotiation, but that "it's really ironic that the American administration still talks about what they call the 'deal of the century.'" "What is left for this administration to give to the Palestinian people?" he asked. "What is left as a political solution?" Added Abbas: "We are not redundant. Why are we treated as redundant people who should be gotten rid of?" The Palestinians' upcoming chairmanship stands to boost their aspirations for official statehood but angers Israel. While meeting with Netanyahu on Wednesday, Trump told reporters he believes that two states — Israel and one for the Palestinians — "works best." He has been vague on the topic, suggesting he would support whatever the parties might agree to, a message he also recapped Wednesday. "If the Israelis and Palestinians want one state, that's OK with me. If they want two states, that's OK with me. I'm happy if they're happy," he said. Hours before Netanyahu's scheduled speech, Israeli Defense Minister Avigdor Lieberman expressed indifference to Trump's remarks, saying that the Israeli interest is "a safe Jewish state." A Palestinian state "simply doesn't interest me," Lieberman said. Netanyahu had reluctantly accepted the concept of Palestinian statehood but has since backtracked. A top coalition partner is threatening to topple his government if it returns to the agenda. The two sides in one of the world's most high-profile and volatile conflicts are always forceful voices at the U.N. and its annual General Assembly, but their leaders are speaking after a particularly eventful year in their relations. At least 137 Palestinians, mostly unarmed, have been killed by Israeli fire since the border protests began on March 30. During that time, a Gaza sniper killed an Israeli soldier. Hamas and Israel came close to serious conflict earlier this summer as violence soared along the border. Gaza militants bombarded southern Israel with mortars and rockets, and Israel struck Hamas targets in Gaza. Palestinians have been split since Hamas seized Gaza in 2007, ousting forces of Abbas who now governs just parts of the West Bank. Repeated reconciliation attempts have failed, and Abbas warned that it could take further measures against Hamas if deadlock persists. Palestinians were infuriated, and many Israelis were thrilled, by a series of decisions Trump has made within the last year, starting with his recognition of Jerusalem as Israel's capital. The Palestinians also claim the holy city as the capital of an eventual state. Earlier this year, Trump followed up on the recognition by moving the U.S. Embassy in Israel from Tel Aviv to Jerusalem, a step that was widely protested by Palestinians and others in the Arab world. Other leaders who spoke Thursday included Haiti's President Jovenel Moise, who told leaders he had "spared no effort to ensure that institutions are stable and to make sure we are creating a safe and stable environment conducive to investment and to relaunching growth" in his country since the U.N. peacekeeping mission there wrapped up in October 2017. The mission had helped the most impoverished country in the Western Hemisphere through 13 years of political turmoil and natural catastrophe. It has been followed by a new "stabilization" mission made up of about 1,300 international civilian police officers, along with 350 civilians tasked with helping Haiti reform its justice system. The Caribbean island country faces economic and environmental challenges, including its vulnerability to natural disasters. It suffered heavy blows from a devastating 2010 earthquake and Hurricane Matthew in 2016. Earlier, Lithuania's president assailed world leaders for being "too quiet, too passive, too ignorant" in the face of abuses, corruption and inequality, and took a dig at Trump's America-first vision. "We cannot let the voice of nationalism and division win over dialogue and cooperation," said Lithuanian President Dalia Grybauskaite.